The small GTPase ADP-ribosylation factor 6 (Arf6) belongs to the Arf subfamily of Ras superfamily GTPases. Of the three classes of Arf GTPases, Arf6 is the only member of class III and uniquely localizes to the plasma membrane and endosomes, positioning it to regulate cellular processes dependent upon dynamic changes in the actin cytoskeleton, including endocytosis, exocytosis, trafficking/recycling of membrane-localized proteins, and membrane protrusions (e.g., ruffles). These cellular functions underlie physiological and pathological cell motility and intracellular trafficking. Arf6 cycles between an inactive, GDP-bound state and an active, GTP-bound state to act as a molecular switch in the cellular processes listed above. Activation of Arf6 by exchange of GDP for GTP is mediated by guanine exchange factors (GEFs) while inactivation by GTP hydrolysis is mediated by GTPase activating proteins (GAPs)1-3. In this newsletter, we discuss the mechanistic roles Arf6 and its GEFs have in cancer cell invasion and metastasis. Cancer cell invasion and metastasis require dynamic changes in the actin cytoskeleton. Recent work demonstrates that Arf6 has an essential role in tumor angiogenesis and growth, as well as cancer cell invasion and metastasis4-8. Moreover, Arf6 GEFs such as BRAG2/GEP100, cytohesin3/Grp1, and EFA6 are also involved in cancer progression5,7,8. Prevention of Arf6 activity/cycling inhibits cancer progression6,7,9. Of the fourteen known Arf GEFs, eight target Arf6, and of those, five are Arf6-specific. Arf6 GEFs are activated directly through binding with the pleckstrin homology (PH) domain and recruited to the plasma membrane by binding to phosphoinositides produced by phosphatidylinositol 3-kinase (PI3K), as well as a variety of ligand-activated cell surface receptors. There the GEFs' catalytic Sec7 domain activates membrane-localized Arf6. BRAG2/GEP100 and EFA6A-D activate only Arf6 while cytohesin1, cytohesin2/ARNO, and cytohesin3/Grp1 target Arf6, among other Arfs1-3. GEP100, the best-characterized Arf6 GEF, promotes the invasion of breast cancer, melanoma, and lung adenocarcinoma cells5,6,10,11. In response to epidermal growth factor (EGF) stimulation, GEP100 directly binds the ligand-occupied EGF receptor (EGFR) and activates Arf6 at the plasma membrane5 (Fig. 1). In turn, GTP-bound Arf6 recruits and activates AMAP1, a downstream effector, which mediates invadopodia formation, the initial step in cancer cell invasion10. Activated Her2, human epidermal growth factor 2, also stimulates GEP100-mediated Arf6 activation, which positively regulates cancer cell invasion11. The vascular endothelial growth factor (VEGF) also activates Arf6 via GEP100, stimulating angiogenesis in endothelial cells12. GEP100-mediated activation of Arf6 also stimulates cancer cell invasion and metastasis via disassembly of E-cadherin-mediated cell-cell adhesion10 (Fig. 1). In addition, the Wnt family member 5A (WNT5A) also activates Arf6 through GEP100 in melanoma cells. WNT5A-mediated activation of Arf6 through GEP100 disassembles the b-catenin/cadherin complex. Unbound b-catenin promotes tumor cell invasion and metastasis through b-catenin-mediated transcription and disruption of cell-to-cell adhesions (i.e., adherens junctions)6 (Fig. 1). These effects are prevented in the presence of SecinH3, a small-molecule inhibitor of GEP100 and the cytohesin family of Arf GEFs6. Figure 1. 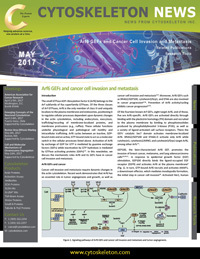 Signaling pathways of Arf6 GEFs and cancer cell invasion and metastasis and tumor angiogenesis. Within the EFA6 family of Arf6 GEFs, a positive or negative regulatory effect is possible, depending on the particular EFA6 GEF isoform and type of cancer. For example, EFA6A positively regulates glioma cell invasion13, while EFA6B antagonizes breast cancer cell invasion14. The EFA6A-mediated effects utilize the extracellular signal-regulated kinase (ERK) signaling cascade13, which complements an earlier finding that Arf6-induced melanoma cell invasion requires ERK signaling15. Complicating matters is the capacity of EFA6A, B, and C isoforms to positively regulate cancer cell invasion, metastasis, and drug resistance8. Grp1-mediated activation of Arf6 regulates hepatocyte growth factor (HGF)-dependent tumor angiogenesis via an Arf6-stimulated increase in b1 integrin recycling from the endosomes to the plasma membrane7 (Fig. 1). b1 integrin recycling to the plasma membrane is necessary for anchoring of cancer cells to allow maturation of newly formed blood vessels. SecinH3 inhibits these effects7. Grp1 has also been reported to control breast cancer cell migration16. Inhibition of cytohesins and GEP100 is accomplished with the small-molecule Arf GEF inhibitor SecinH3, as discussed above. In animal models, SecinH3 inhibits glioma cell metastasis and angiogenesis of melanoma and lung carcinoma tumors6,7; however, treated animals develop hepatic insulin resistance17. Another molecule is PIT-1 which inhibits phosphatidylinositol-3,4,5-trisphosphate (PIP3), the lipid product of PI3K and regulator of the Akt cell survival and growth signaling pathway. PIT-1 prevents PIP3 binding to the PH domains of ARNO and Grp1 which results in inhibition of lamellipodia formation and breast cancer cell migration1,2,16. In addition, melanoma tumor angiogenesis and metastasis are inhibited. Additional work is required to differentiate the contributions of ARNO and Grp1 to tumor invasion/metastasis and determine if one or both GEFs are targeted in PIT-1’s anti-cancer effects. Recent studies of the Arf6 GTPase and its GEFs demonstrate that these proteins have a clear role in cancer cell invasion and metastasis and tumor angiogenesis. Moreover, some findings suggest that specific cancers are associated with certain GEFs. This observation offers the possibility of very selective, novel anti-cancer treatments targeting Arf6 and/or its GEFs. To assist scientists in these studies, Cytoskeleton Inc., offers Arf6 activation assay kits along with kits for many other Ras superfamily GTPases. The activation assays come in two convenient, easy-to-use formats, the effector bead pull-down assay and the ELISA-based G-LISA assay. In addition, we offer GEF and GAP exchange assay kits and reagents for monitoring changes in F-actin in fixed and live cells. To learn more about these and other tools for measuring GTPase-mediated, dynamic changes in the cytoskeleton, please contact one of our technical support scientists at tservice@cytoskeleton.com. Yamauchi Y. et al. 2017. Machineries regulating the activity of the small GTPase Arf6 in cancer cells are potential targets for developing innovative anti-cancer drugs. Adv. Biol. Regul. 63, 115-121. Hongu T. and Kanaho Y. 2014. Activation machinery of the small GTPase Arf6. Adv Biol. Regul. 54, 59-66. Donaldson J.G. et al. 2011. ARF family G proteins and their regulators: roles in membrane transport, development and disease. Nat. Rev. Mol. Cell Biol. 12, 362-375. Hashimoto S. et al. 2004. Requirement for Arf6 in breast cancer invasive activities. Proc. Natl. Acad. Sci. U.S.A. 101, 6647-6652. Morishige M. et al. 2008. GEP100 links epidermal growth factor receptor signalling to Arf6 activation to induce breast cancer invasion. Nat. Cell Biol. 10, 85-92. Grossmann A.H. et al. 2013. The small GTPase Arf6 stimulates beta-catenin transcriptional activity during WNT5A-mediated melanoma invasion and metastasis. Sci. Signal. 6, ra14. Hongu T. et al. 2015. Arf6 regulates tumour angiogenesis and growth through HGF-induced endothelial b1 integrin recycling. Nat. Commun. 6, 7925. Hashimoto S. et al. 2016. Lysophosphatidic acid activates Arf6 to promote the mesenchymal malignancy of renal cancer. Nat. Commun. 7, 10656. Yoo J.H. et al. 2016. ARF6 is an actionable node that orchestrates oncogenic GNAQ signaling in uveal melanoma. Cancer Cell. 29, 1-16. Sabe H. et al. 2009. The EGFR-GEP100-Arf6-AMAP1 signaling pathway specific to breast cancer invasion and metastasis. Traffic. 10, 982-993. Menju T. et al. 2011. Engagement of overexpressed Her2 with GEP100 induces autonomous invasive activities and provides a biomarker for metastases of lung adenocarcinoma. PLoS One. 6, e25301. Hashimoto A. et al. 2011. GEP100-Arf6-AMAP1-Cortactin pathway frequently used in cancer invasion is activated by VEGFR2 to promote angiogenesis. PLoS ONE. 6, e23359. Li M. et al. 2006. EFA6A enhances glioma cell invasion through ADP ribosylation factor 6/extracellular signal-regulated kinas signaling. Cancer Res. 66, 1583-1590. Zangari J. et al. 2014. EFA6B antagonizes breast cancer. Cancer Res. 74, 5493-5506. Tague S.E. et al. 2004. ADP-ribosylation factor 6 regulates tumor cell invasion through the activation of the MEK/ERK signaling pathway. Proc. Natl. Acad. Sci. U.S.A. 101, 9671-9676. Miao B. et al. 2012. Inhibition of cell migration by PITENINs: the role of ARF6. Oncogene. 31, 4317-4332. Hafner M. et al. 2006. Inhibition of cytohesins by SecinH3 leads to hepatic insulin resistance. Nature. 444,941-944.